Large crude and LNG carriers; container and other merchant ships; naval auxiliaries; special purpose vessels. Jumboizing and conversion. 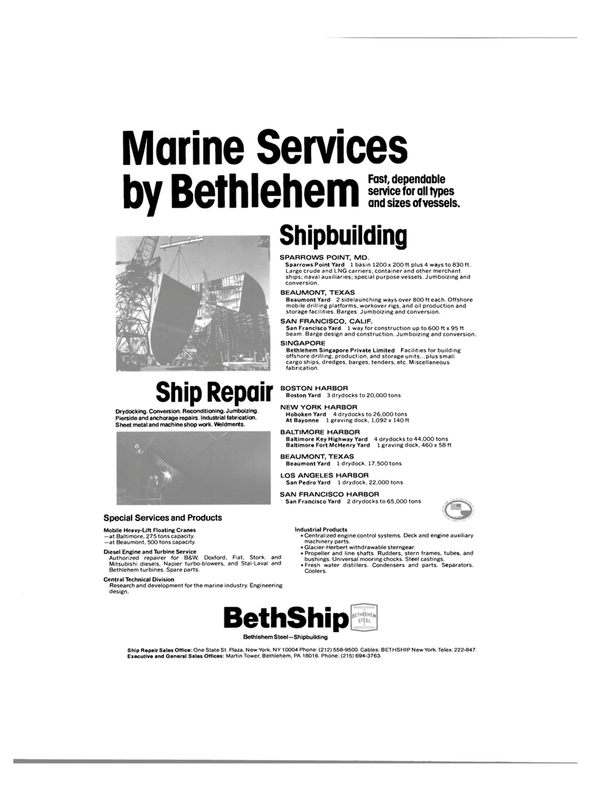 Bethlehem Singapore Private Limited Facilities for building offshore drilling, production, and storage units...plus small cargo ships, dredges, barges, tenders, etc. Miscellaneous fabrication. Mobile Heavy-Lift Floating Cranes —at Baltimore, 275 tons capacity, —at Beaumont, 500 tons capacity. Ship Repair Sales Office: One State St. Plaza. New York, NY 10004 Phone: (212) 558-9500. Cables: BETHSHIP New York. Telex: 222-847. Executive and General Sales Offices: Martin Tower, Bethlehem, PA 18016 Phone: (215) 694-3763.